Mars' largest moon Phobos, as seen during a recent flyby performed by the European spacecraft Mars Express. Mars' largest moon is an oblong cratered rock named after the Greek god of fear. Yet the frightful moon Phobos is hiding fewer secrets after a recent close flyby from the European spacecraft Mars Express. The European Space Agency's probe passed within 62 miles (100 kilometers) of the Martian moon Jan. 9. The encounter produced a collection of new photographs that reveal the satellite's pockmarked surface, including a possible landing site for a planned Russian sample-return mission to the moon. While Mars Express snapped the photos on Jan. 9, the probe had to wait until completing a suite of other observations before beaming the Phobos views back to Earth, ESA officials said. Phobos is one of two moons orbiting around the Red Planet; the other is Deimos (meaning "dread" in Greek). There is some controversy over how the moons formed, but one idea is that they were born when a comet or asteroid slammed into Mars and rubble debris from the collision condensed into the moons. Phobos will be the site of the planned Russian Phobos-Grunt mission, which will launch late this year or early 2012, and will send an unmanned lander to touch down on the surface of Phobos, collect a sample of dirt, and return it to Earth. The mission aims to study Phobos' geology and origin, and will search for signs of possible past or present microbial life on the moon. This photo, taken by Mars Express' High Resolution Stereo Camera, shows a 3-D view of the pockmarked surface of Phobos created by years of impacting meteorites. This picture of Phobos shows two possible landing sites for the Russian Phobos-Grunt mission. The oval in red marks a spot that was previously being considered, while the blue oval denotes the currently favored landing site. 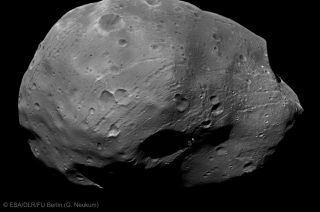 In this picture, seven close-up views of Phobos, taken by the Super Resolution Channel on the High Resolution Stereo Camera, are superimposed on the wider view. The view of Phobos from all five channels on Mars Express' High Resolution Stereo Camera. Mars Express launched in June 2003 and entered orbit around Mars in December 2003. It is scheduled to operate until at least the end of 2012.